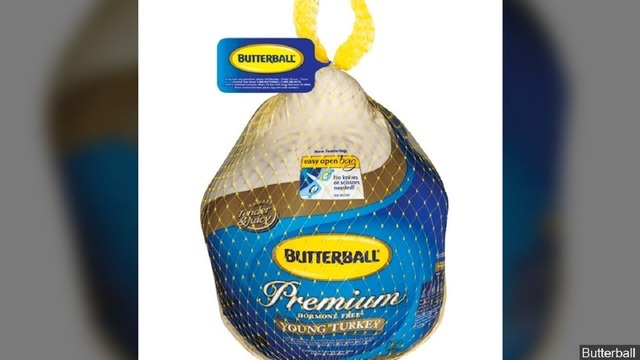 Butterball, perhaps the nation's best-known turkey brand, is recalling 39 tons of turkey because it might be tainted with salmonella. (CBS) - Butterball, perhaps the nation's best-known turkey brand, is recalling 39 tons of turkey because it might be tainted with salmonella. The recalled ground poultry products were distributed nationwide to institutions and retailers, including Kroger and Food Lion, the U.S. Department of Agriculture's Food Safety and Inspection Service announced late Wednesday. North Carolina-based Butterball is recalling just over 78,000 pounds of raw ground turkey products that could be contaminated with what's known as salmonella schwarzengrund, according to the agency. The USDA warned consumers not to consume the recalled product and to instead discard or return it to their local store (see list below and product images here). The possible Butterball contamination was discovered by federal and state public health officials investigating a multistate outbreak of salmonella schwarzengrund that sickened five people in two states. Wisconsin officials collected three Butterball brand ground turkey samples from a home where residents had fallen ill.